The Unity design team is hip hopping today and I have some Stamp of the Week cards that I haven’t shared yet. If you didn’t start at the beginning of the hop, make sure you head over to the Unity blog. LOTS of great projects from the design team today. 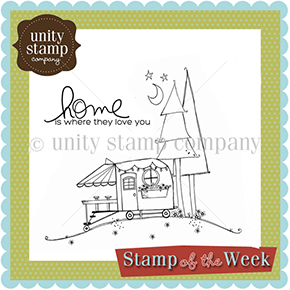 Want more info on the Stamp of the Week??? HIP HOP COMMENT PRIZE: don’t forget to leave a comment on each blog today. We’ll be giving away 3 prizes from comments left on the design team’s blogs. That is all from me, head on over to the amazing Natalie next!!!! Lisa, I love your birdie card!!! It’s so gorgeous I pinned it immediately. I love how you used the stamps to make such a simple but yet stunning card! I just love both of your cards. The paper pieced pumpkins are absolutely adorable! Ahhhh! Patchwork pumpkins? How adorable is THAT? !Love the layout too – that twine bow is just perfect! Just love your pumpkin card, adorable!!!! These cards are so cute, especially love the pumpkins! Both cards are great, but I especially love how you colored your pumpkins. Lisa, I love both of your cards! The design of the first one is so elegant! Love the stamped doily on the patterned paper. Beautiful! Love the bird card. So simple, yet so nice. Love that home sentiment… so true. All your designs are lovely. great cards! my SOTW with the pumpkins arrived today ~ I can’t wait to ink it up! Your cards are adorable! Thanks for sharing. Great cards! Love how CAS and sweet the first is, what a great sentiment! And great coloring on the second! Beautiful cards, love your style! Beautiful work. I love the pumpkins, and the bird card is so simple but elegant. Loved both the cards !!! The bird card is stylish and the pumpkin one is perfect for HAlloween. I love Unity . It touches all aspects of life. I love both your cards!! And what a clever idea with the birds wing, so pretty!! Fantastic projects. Thanks for sharing. Lisa I love your work… It’s always so inspiring!! Love both your cards… TFS ! I love those little pumpkins. They are so cute. you did a great job. SUPER SUPER cute! LOVE these–esp. those pumpkins! FUN!!! How great are these? I love them both! SOTW ROCKS!!! Love the paper patterns and vibrant pumpkins! Very cute cards using these stamps! Great Cards!! Love the little pumpkins!! Wonderful cards! I really like the CAS look of the first- the cluster at the bottom is great. Love these cards, Lisa! I especially love the polka dot background paper. I always love a patterned card front but have a hard time doing it myself. You make it look SO easy! First card adorable, second card fun! Sweet cards…the doily under thecpretty bird on the first card is so elegant and those pumpkins are adorable. Very cute cards! I love the pumpkin one-can’t wait to use that stamp! Such sweet cards Lisa! LOVE your sweet bird!